I still drive one (pictured beside the Mirage loaner from Mitsu Canada): a base 1998 Pontiac Firefly 5-speed (Canadian market Metro clone). And I have a '91 convertible version (also 5-speed) parked in the garage awaiting some restoration work. For a couple of years I also had a 2000 Honda Insight hybrid: advanced 1.0L 3-cyl engine coupled to a small electric motor/generator and 5-speed transmission. So, did you come to the Mirage with 3-cylinder experience? Post a pic if you did! Personally I compare the Mirage to the Audi A2, at least as far as what is available in the US today. 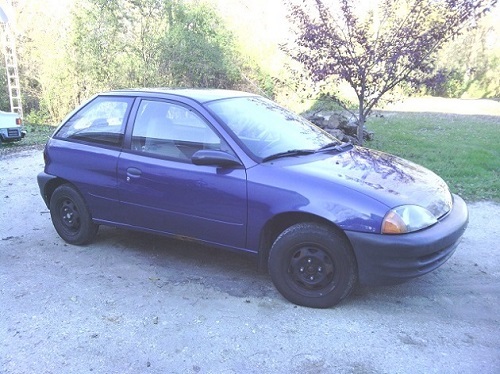 I owned a multitude of Metro's before buying the Mirage. It's been more than 10 years since I've owned a sub compact selling my last Metro in 2003. Feels good to be back in the hyper mpg world. I still own my Daihatsu Cuore L251 Edition 25 Plus with 265000 km on the odometer. It also needs some restoration work, but still drives well and has a fuel consumption comparable to the Space Star. The Space Star is a slow glider compared to the Daihatsu which is much more fun to drive, but not nearly as save, and with absolutely no comfort features. I currently daily drive a 1999 Chevy Metro. Love the MPGs. 1 Chevy Sprint and 4 Geo Metros.